Thank you to Yuril for allowing me to Edit his Ice & snow textures. Thank you to Urwy for his tips in NifSkope. Added Glow map to Frost Staff. Various texture fixes using correct DTX (.dds) formats. .esp Cleaned of a wild edit. .esp cleaned of an edit that did not carry forward a fix from the unofficial patches. Minor edit to Crystal on Forsworn Staff to look more fire like & glow. 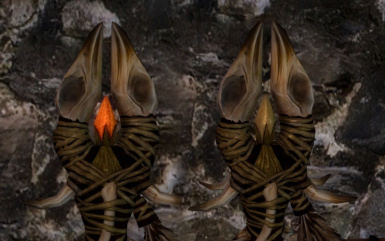 I never liked how every single destruction staff in Skyrim looked identical to every other (barring the forsworn). 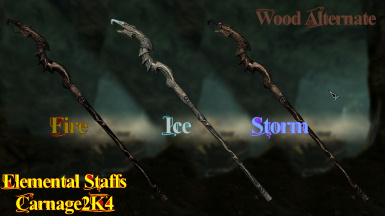 so I put together this little texture mod to give the staffs some more flavour. 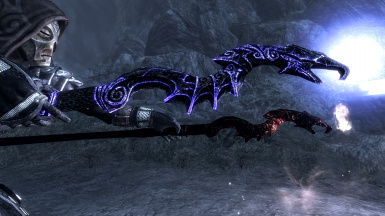 type Staffs have the Lightning texture, there are still 1 or 2 vanilla textured staffs in the game. 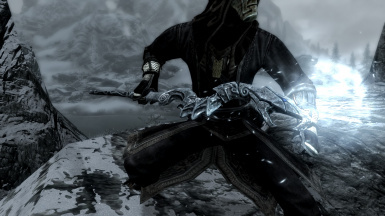 The Forsworn Staffs have also had a minor change in that now the crystal in the staff glows & is a little more fire like. It's ONLY a texture change, the staffs function exactly the same as in Vanilla. (countable and uncountable; plural staffs or staves or staff) A musical staff. 1. (plural staffs or staves) a long, straight stick, especially one used to assist in walking. 2. (music, plural staves) A series of horizontal lines on which musical notes are written. 3. (plural staff) The employees of a business. 4. (uncountable) A mixture of plaster and fibre used as a temporary exterior wall covering. 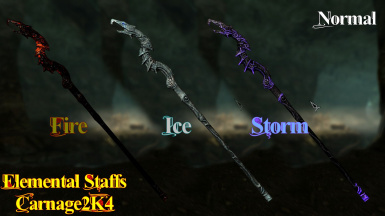 both "Staffs" and "Staves" can be used as a plural for "Staff". the only time it matters is in the 2nd definition, not in the 1st that this mod title means, I have chosen to use "Staffs". Or extract directly to that location this is a first release and you should not need to overwrite anything. A few people have experienced a shudder on swapping over to a staff with the mod installed, I myself do not experience this and am unsure on how I can help their situation. I have attempted to alleviate shudder in the 1.15 release by recompiling all textures as "more correct" DXT# formats for .dds, previously I had just used DXT5 with standard parameters. However this is a mediocre way of saving in .dds, after learning some more about DXT formats and what each does, I believe I have now correctly saved each texture in its proper format with correct parameters. eg. Glow Maps no longer have mipmaps, and Diffuse Maps are now all DXT1 as they contain no alpha layers, DTX1 has better quality compression which should help with the texture loading. Alternate texture sizes have also been further modified to help with potential shuddering,, Glow Maps do not need to be the same size as the Diffuse (primary) Texture, so they have all at half size, this should not be a visually noticeable change, but it will help with texture loading. Added Glow map and small edit on crystal of Forsworn staff. Glow Map for Fire staff Fixed. Thank you S.T.E.P. team for adding this mod to the S.T.E.P. Guide.